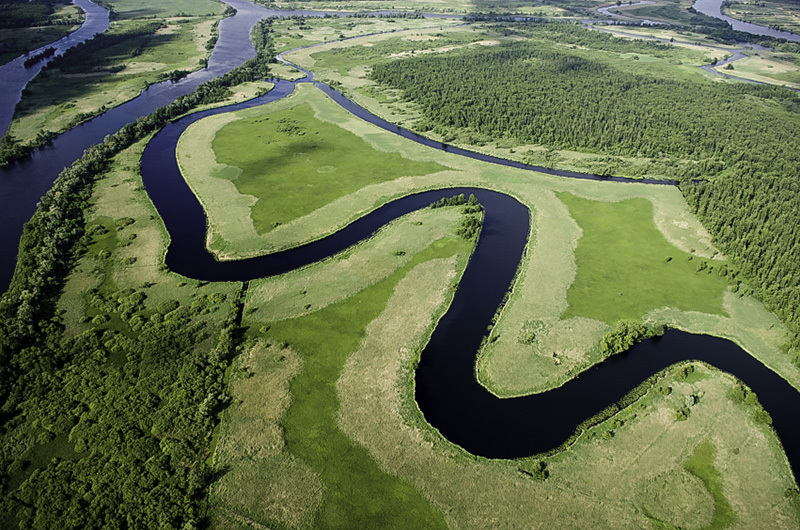 Click to enlargeA river forms a continuum, along which many parameters change: discharge, current, sediment and temperature, food sources as well as communities. 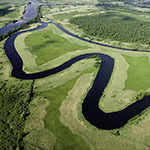 Small Mountain Rivers mainly have single channels, more downstream the channel changes to braided and meandering patterns. Floodplain and rivers are closely interlinked. Like most other aquatic ecosystems in Europe, river ecosystems have been severely impacted by a multitude of human uses. Water abstraction, damming, pollution and habitat modification have dramatically diminished the functionality of these systems. Small Mountainous streams that are usually less inhabited, remained nevertheless relatively undisturbed. Physical alterations in their catchments affect most European rivers disrupt their continuum and the interactions between the stream and its terrestrial surroundings. As with other stressors, climate change will result in complex cause–effect chains, the link between them provided by many interacting environmental parameters, which are directly or indirectly influenced by temperature and precipitation. Running waters are particularly vulnerable to global change and its associated stressors because they are relatively isolated and fragmented within terrestrial landscapes and are already heavily exploited for the goods and services they provide. Only 0.006% of the world’s surface is represented by running waters, yet freshwater ecosystems contain approximately 6% of all described species, many of which have restricted thermal and hydrological tolerances (Perkins et al 2010). Climate change will contribute to a general upstream movement of river zones, particularly affecting species bound to small streams and springs, which can not move further upstream. Since ectotherms (i.e. “cold-blooded” animals that depend on external sources for regulating their body temperature) represent approximately 99% of all freshwater species, global warming will have particularly profound impacts on individual metabolism and, by extension, the physiology, bioenergetics, behaviour, abundance and distribution of species populations, with consequences for food web structure and dynamics. Edwards et al., 2012 (REFRESH Deliverable. 2.14). Review on processes and effects of droughts and summer floods in rivers and threats due to climate change on current adaptive management strategies. IPCC 2007a. Contribution of Working Group II to the Fourth Assessment Report of the Intergovernmental Panel on Climate Change. Cambridge University Press, Cambridge and New York. IPCC 2007b. Summary for policy makers. In: Contribution of Working Group II to the Fourth Assessment Report of the Intergovernmental Panel on Climate Change. Cambridge University Press Cambridge and New York. 7-22 pp. Logez et al., 2011 (WISER Del. 5.1-3). BQEs sensitivity to global/climate change in European rivers: implications for reference conditions and pressure-impact-recovery chains. Feld et al., 2011 (WISER Del. 5.1-2). Driver-Pressure-Impact and Response-Recovery chains in European rivers: observed and predicted effects on BQEs.